In this new collection of works, Grotto, Richard Blackwell examines the context of a retreat as a customary interior from which to interpret the world. The degree of remove between observation and translation relocate Grotto within the vicinity of the contemporary cave, a retreat in which the screen is now established as the ritual enabler of images. The geology of Grotto navigates this juncture of dislocation, his work establishing a series of purposeful faults from which the viewer can substantiate an entry and request an exit; Blackwell’s virtual caves invite discovery, but are pleasurably disconnected from a tour of established relics. Although ‘Under Construction’ Blackwell’s sites are very much open for inspection, however the archaeology of Grotto’s conduits is positively suspended between the physical retreat and virtual remove, a lapse in recognition becoming a requirement to ones location. Throughout Grotto the primitivism of Blackwell’s connections hover like an overseer, our habitation of the virtual world is referred back to the visual ancestry of cave drawings in which imagery provided assimilation with intended prey. In Grotto the retreat of the screen provides the seclusion of the cave in which imagery is once again the arbitrator. However by presenting a digitised geology Blackwell codes the point of entry, there is a latent fine print in operation. These openings can be seen as temporal gateways to extended virtual absorption or recalibrated as x-rays with which to objectify such an encounter. Blackwell holds the viewer on the periphery of admission. Entry into a grotto is by definition a journey into ornamentation, a structure in which threads of reality combine to link the experience. This point of assemblage has been the staple foundation in Blackwell’s previous architectural ciphers such as the Supernolet. Although Grotto is a development from this work once again Blackwell’s suspension or erasure of visual evolution interrupts the sequence of location to become either a prequel or sequel; perhaps they one and the same? Although the former offers a utopian invitation, the conjoined axis of the Supernolet denies entry or even the obligatory fly-through. Once again the spectator is held externally by the image, accommodation is strictly off plan; Blackwell continually criss-crosses the codes of habitation, tempting the reward of a physical outcome ever closer. Is the grotto this endpoint, an amalgam of over-anticipation and underdevelopment and therefore are the physical objects within Blackwell’s Grotto the debris or evidence of such collisions? When first encountered the objects presented within Grotto appear to conclude the visual narrative that surrounds them, either as tangible proof of some implied, but unseen impact or as attributed models. Although they do propose a scale, it is indeterminate and thus confirms more the slippery nature of the meeting. Critically Blackwell’s objects share an affinity with the Surrogates of Allan McCollum and the ‘model’ buildings of Julian Opie. In reference to McCollum, Hal Forster describes their transformation “into an object of critical play”. As premature ejections from his codified universe, Blackwell interrupts the expectation of these works as merely blueprints to physical exchange; they contain faults as deliberate points of inspection. This interruption of serial production prevents the objects within Grotto from becoming simply replicas of translation, they are incomplete, identity is deferred. 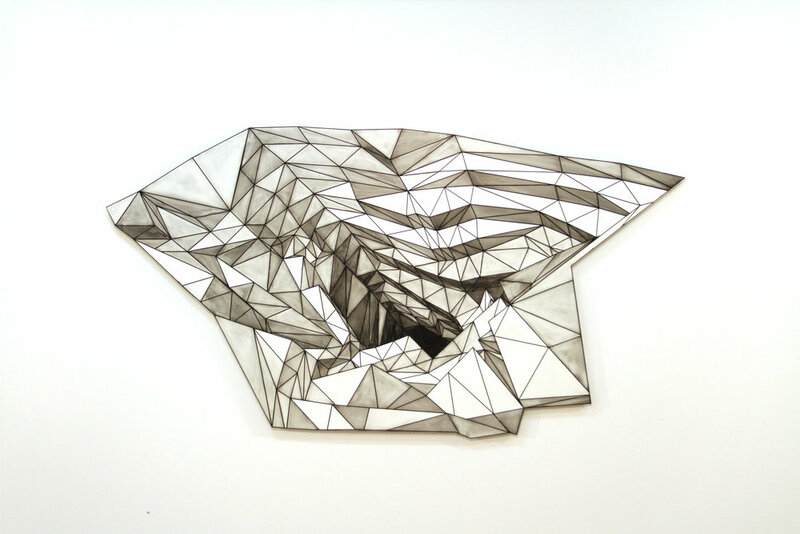 The implied geology of the images is re-mapped through folded veneers and additionally herded by a latent geometry. Blackwell stops this mask short of a deception by leaving the seal incomplete. The void is the heart of their integrity, the goods are reassuringly faulty; Lynne Cooke describes Opie’s buildings as having similar attributes. As the artefacts within Grotto, Blackwell presents another proposition with these objects; consolation or continuation, exit or re-entry? Do we wish to retreat from the experience and take our prize now or allow the faults to recalibrate an entry? Grotto examines the loop of visual orders and to what extent we are willing to spoil the illusion. Hal Forster, “The Art of Cynical Reason” in Return of the Real (Cambridge, Mass. : MIT press, 1996), 116. “Yet their very blankness coupled with an assertive oddness of scale makes them surprisingly compelling”, Lynne Cooke, “Rehearsing Realities: Julian Opie’s Scaled Buildings” in Julian Opie (London, Thames and Hudson, 1994), 67.